So just what targets might they have been? Holding more than 100,000 internal meetings? Pushing paperclip consumption to new highs? Nobody knows. Traditionally, Civil Servants didn't get bonuses. They got their salaries and that was that. But at some point the mandarins obviously looked at the City and elsewhere in the private sector, and decided superior performance there must reflect the payment of bonuses. They concluded that Civil Service performance could be improved by following suit. But there are important differences. The public sector is not targeting profit, or any such clearcut objective. Indeed, that's one of its manifold organisational problems. So there is no transparent and robust linkage back to a real world objective. Just another pile of box ticking that has us paying out more than we need for things we never wanted in the first place. Public sector bonuses are awarded pretty well irrespective of overall performance. All the indications are that senior management is too weak to withold them even if everyone can see performance isn't up to the mark. 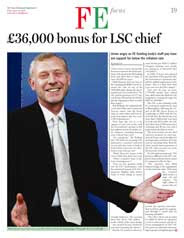 As the BBC spokesman put it, “bonuses are part of staff’s contractual entitlement”. In other words, they're not about incentivising at all, but simply extra salary.